How would you like a luxury vacation home close to Disney World and the other theme parks? You can vacation next to one of the best golf courses, near to some fine restaurants, and within a short drive to major shopping areas? You can do all of this and still enjoy the peacefulness and tranquility of relaxing in our townhouse away from all of the noise. We are just minutes away from all of these activities but the townhome is in a really quiet area and far enough away that you will feel that you are in another world while enjoying all that our townhouse and resort has to offer. Your stay at our townhouse will help to make your Florida vacation memorable and relaxing. Our privately owned four bedroom, three and a half bath Florida vacation townhouse is located at Regal Palms Resort and Spa at Highlands Reserve. It is right next door to the Highlands Reserve Golf Course. Our home is the largest sized end unit at Regal Palms Resort with a living space of 1,856 square feet. Perfect for any size family or group. We have fitted 5 flat-screened LCD TVs, mainly wall mounted, with all T.V's having a DVD either integral or alongside, making it convenient for everyone to watch their favorite shows. Located in the prestigious resort of Regal Palms at Highlands Reserve, our UPGRADED townhouse has all the facilities to guarantee a truly relaxing vacation. All beds are upgraded pillow tops and are really comfortable, with beautiful soft pillows. There are two master suites each with en-suite bathrooms and king size beds in both. The sitting room is furnished with a gorgeous comfortable queen size sofabed and loveseat, and a fantastic dining table and chairs in the dining area. While vacationing in our home you will have access to the resort pool facilities, such as the Lazy River, water slide, and hot tub. Inside the Clubhouse you can enjoy the sports bar, games room, internet cafe, and restaurant. Bring your laptop with you and you will have access to FREE wireless internet service inside the clubhouse and outside on the veranda at the poolside area. The fantastic Highlands Reserve golf course is right across the road from the resort! Enjoy the services of the health/fitness center and beauty spa. The resort even provides FREE shuttle service to Magic Kingdom each day. The resort offers transportation to other area theme parks and attractions for a fee. Transportation is available for Orlando International Airport, Sanford Airport, and other points of interest. You will find the resort staff friendly and helpful so that your stay in our home will be a vacation that you will remember for years to come. We offer discounts for rentals of 8 days or more so please contact for details, and confirmation of availability and cost. Please note that at this resort the management charge $15 per day resort fee, this cost does not come to us! This charge is per house, per day and not per person and is charged to every house on the resort for temporary membership to the clubhouse and all the facilities at the resort including towels etc! I am a lady who loves to travel and always like to stay somewhere in comfort and close proximaty to all facilities and attractions. That's why I love my home at Regal Palms. It is furnished by myself to a very high standard and close to all the places I want to visit on my vacations. Fantastic facilities at the resort, close to Disney and all other attractions. The resort is well kept and the homes are spacious and well designed. The resort is well maintained and offers all the facilities I might want from a stay in Florida. If I don't want to venture out of the resort, there is always plenty to do on site for myself and any of my guests. Huge pool complex with water slides and lazy river in resort. Management responded quickley to bug infestation. We have never encountered such a vacation home that had bed bugs. Management brought in Terminix and sprayed the entire house. The owner had to put us up at another villa. It cost her alot for this situation, but it also inconvenience us to no end. We had to move twice and remove all our clothing and food and then wash everything or at least put them in a dryer. Unfortunately, this was not the end of the bugs. Terminix had to come back a second time and spray. I was bitten over 30 times and yet the owner didn't feel she owned us any refund. Would never do business with her again. Twin bed mattresses are very uncomfortable. I would recommend replacement. Saw tiny roaches in one of the queen bedrooms twice. I am really sorry you felt the beds were not up to standard. I was there myself recently and checked all the beds and they seemed fine, they were also very expensive beds and are not that old. I will get my management agent to have a look at them again. I will also put in a report about the roaches as I pay to have the house sprayed every month for any bugs, so this should never occur. Plenty of room and we’ll equipped. Comfortable property in terms of size. For shorter people, the bed in the downstairs master is awfully high. A step stool would be helpful getter t and out. Thank you for taking the time to review the property and I am very glad you enjoyed your stay. I take note of the bed height as I myself am only 5ft tall! I will look at getting a small step for the future. I am currently at the home replacing items and repainting, so the house is even better equipped now than it was and looking really nice. Please remember that I offer discounts for repeat guests should you wish to visit again in the future! Nice rental for a great price! 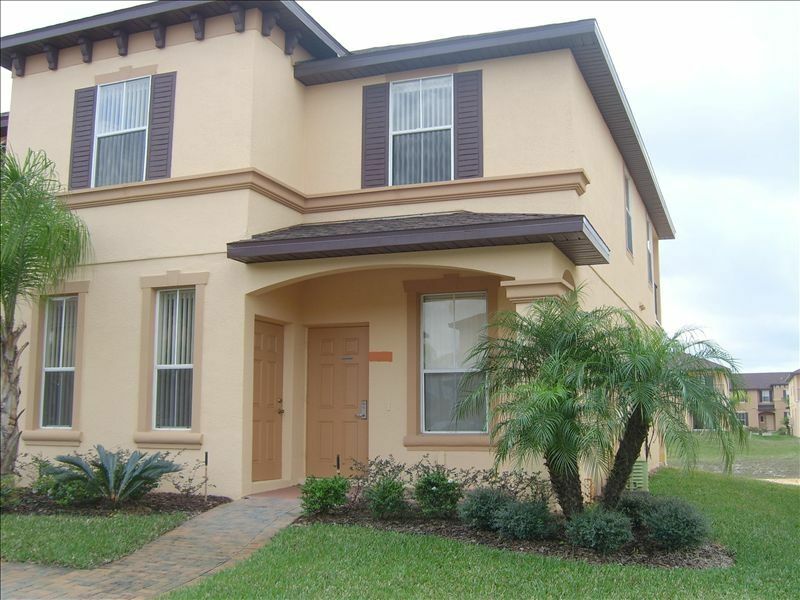 This townhouse was perfect for our 4 day vacation to the parks. The house was equipped with all the basic necessities and was clean. The only thing was that it was further away from the parks than I expected. It took about 25 minutes to drive to Disney but if you are looking for a decent place to stay away from the hustle and bustle of the crowds then this is a great alternative. My kids also thoroughly enjoyed the community pool with the lazy river and slide so I did not mind paying they extra resort fee for the use of the pool (it was cheaper than going to the water parks!). Thank you for a great review and I am glad you enjoyed your stay. Don't forget we offer discounts for repeat guests! I am at the house now and the whole house is being upgraded with new towels and bedding along with all household necessities! Hopefully your next stay will be even better! We enjoyed our stay at Regal Palms for The Holidays. This house had everything we needed and plenty of space for the whole family. We will definitely book again next time we head to Orlando! Really pleased you had a lovely time! Don't forget we give discounts for repeat rentors! The property was peaceful and a nice escape from the hustle and bustle of the park areas. The rooms were spacious with 2 masters. The 2 smaller bedrooms (with 2 twins in each) were also spacious. The property was well equipped with all necessities. WiFi was excellent with 6 devices connected. The location was convenient to the parks and restaurants. Check in/check out was simple. Overall this was a wonderful holiday getaway. I am so glad you enjoyed the house and resort and all they have to offer. We would be delighted to welcome you back to the house in the future and would like to offer you a 10% discount if you should ever like to take us up on this! Please note that at this resort the management charge $15.00 per day resort fee, this cost does not come to us! This charge is per house and not per person and is charged to every house on the resort for temporary membership to the clubhouse and all the facilities at the resort!